Cold compression of carbon nanotubes at 75 GPa results in the formation of a superhard hexagonal carbon polymorph that has a different structure than hexagonal diamond [Wang, et al., Proc. Natl. Acad. Sci 101, 38, 13699 (2004]. This new phase is quenchable to ambient pressure and has an experimentally determined bulk modulus of 447 GPa, slightly higher than that of cubic diamond (440-442 GPa). 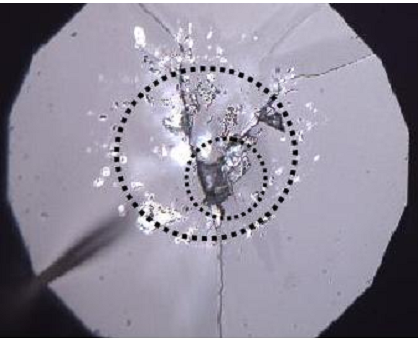 As illustrated in the micrograph above, formation of the superhard material cracks the diamond anvils used in the synthesis, and leaves a 3 micron indentation in the surface of the anvil (smaller circle). The larger circle shows the position of the stainless steel gasket used to contain the sample during compression. 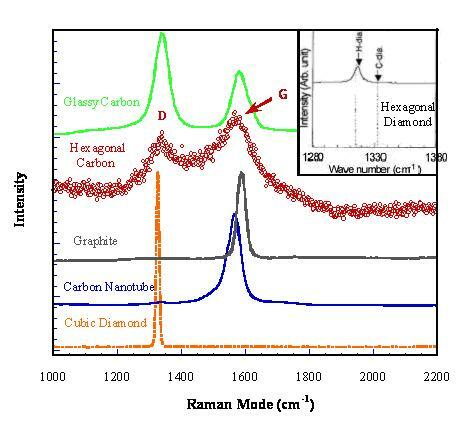 Comparison of the Raman spectra of various carbon materials shows conclusively that the phase is unique and not cubic or hexagonal diamond. For more information on this work carried out at Los Alamos National Laboratory and Cornell University, download the reprint.